A new twist on the young-woman-in-the-big-city theme, Free Food is an enoyable novel about Casey Han and her search for love and fulfillment in 1990s New York. The characters are well-realized, and there is plenty of guilty pleasure in the accounts of clothing, apartments, food and other details of living and striving in NYC. Lee writes from multiple points of view which serves to highlight issues of class and race. The writing itself is good, with the exeption of dialogue, which tends to be stiff. Casey Han is a Princeton graduate, yet grew up in Queens with her financially-struggling Korean parents. While she feels she belongs in the realm of the rich and famous (or at least rich) she has no job or means of supporting herself, leading to some pretty nasty difficulties once her credit card limit runs out. Although there are some other plot threads including romance between boyfriends (should Casey follow her heart's desire and date a white male, *gasp*, while also spurning her parents' wishes, or should she follow in the footsteps of her best friend, Ella, and stick to wealthy Korean boys?) this book basically consists of the ups and downs of Casey's financial predicaments. 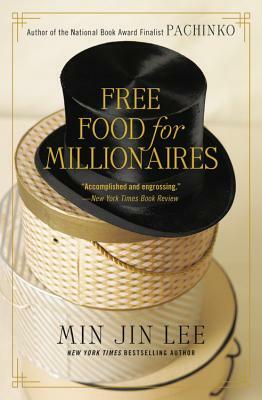 If there's a conflict in Free Food for Millionaires, it most probably will be monetary, however family drama within the Han household did make for some unexpected reading. Although this book starts out with Casey as the main character it quickly expands, including perspectives from Leah Han (Casey's mother), Ella (Casey's best friend), Tina (Casey's sister) and other charecters. What begins as a recent Princeton grad moaning about her financial inadequacies quickly segues to real-life difficulties, reminding us that the real world is more than the facade led by monied individuals. If only it weren't 576 pages, and it might make for a more human-friendly read.